When was the last time you had professional portraits of your family taken? As a professional photographer and also the mother of two little boys, I believe that everyone should have professional portraits taken at least once a year. Let’s face it; this is the only way Mom is going to be in any of the photos. It might also be the only time everyone in the photo has a clean face–at least, that is true in my house. As a mom, however, you also want to capture everyday moments as your family lives and grows. Here are a few tips that will help you be more successful in capturing those moments. 1. Leave your camera out. That’s right, do NOT put your camera in that spiffy case and store it in the hall closet. Leave your camera out on your kitchen counter or a room you walk into everyday. When my boys were babies, I kept my camera in the bathroom! Now my camera sits on my kitchen counter or on my desk. Yes, my $4000 professional camera sits on my kitchen counter and this one thing has made me a MUCH better photographer. Why? Because I actually USE it! Taking lots of pictures is the best way to learn what works and what does not work. My kids are also used to me snapping a few pics as they eat their breakfast or put their shoes on. These are the everyday moments that make up life. 2. Consider your white balance. 3. Use a fast shutter speed for photographing children. Don’t know how to change the shutter speed on your camera? No problem. You can take advantage of the “scene modes” on your camera. There is probably a menu called scene mode. Choose the one with the picture of the child or the picture of the guy running (sport mode). These scene modes will automatically speed up your shutter and you’re less likely to get those blurry shots. 4. Pay attention to the light source. A bright light source should not be behind your subject. Imagine you are in your kitchen and your son is holding his latest craft creation up for you to take a picture. If he is standing right in front of your sliding glass door, the sensor in the camera says, “Oh, this is bright, I do not need a flash.” Then you snap the photo and your son and his creation are very darkly shadowed and the light behind him is super bright. The easiest way to solve this problem is to move him to the side or perpendicular to the light. Now the door is your light source and your camera’s sensor can work to your advantage. Thanks, Tricia, for sharing your tips with us! P.S. These tip will work for pets, too! Do you have any tips to share? Link them up below! White balance is my biggest problem with taking pictures around the house. I need to take the time to play with it more and figure it out. I used to be great with my camera when my daughter was a baby. Now that she's climbing everything and pulling things down, I'm terrified to leave my SLR anywhere. Good stuff! I'm a pro photographer and it's astonishing how much people can learn by reading something like this – which explains important things in ways people can understand. My camera manual fails to do so! My recent post My Baby Is Turning One..In Three Months. Thank you for this post. I need so much help with my Big Girl Camera. I am going to play around with this suggestions! Great post! Good reminders to take pictures of the little things every day! My camera is going in the kitchen tonight. Great tips! I just realized my camera had different scene selections on it… I've been having fun playing around with them. I love all the tips, Tricia! 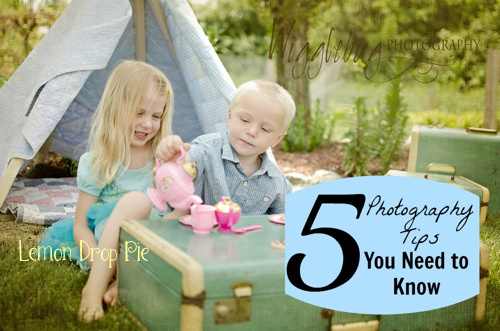 I love to snap pictures, and I need to get better at taking them of my kiddos…These tips will help for sure! Thank you! Bookmarking this post for later!